Salvation from sin is the greatest need people have. But how are we forgiven? What must we do? Consider the answer found in Bible examples of conversion. "What must I do to be saved?" Surely this is one of the greatest questions ever asked. To learn the answer, let us simply look in the Bible for some examples of sinners who received forgiveness. In Acts chapter 2, a great multitude of Jews asked the apostle Peter what they should do about their sins. He replied, “Repent and be baptized every one of you in the name of Jesus Christ for the remission of sins…” (Acts 2:38). Here is a plain and simple statement. People who want the remission or forgiveness of their sins should repent and be baptized. In Acts chapter 8, the Ethiopian treasurer heard the message of Jesus and wanted to be baptized. He was told that before he could be baptized, he must believe in Jesus. So he stated or confessed his faith and then was baptized (Acts 8:35-39). 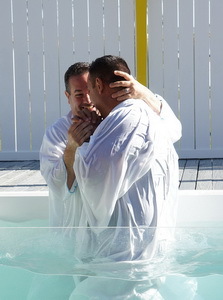 This example teaches that one must hear the gospel, believe it, confess Jesus, and then be baptized. In Acts chapter 22 we read about Saul of Tarsus, a great enemy of the church. Jesus appeared to Saul and instructed him to go into Damascus where he would be told what he must do. In fulfillment of this promise, Ananias came to Saul and told him to “Arise and be baptized and wash away thy sins, calling on the name of the Lord” (Acts 22:16). Other examples of conversion in the New Testament simply repeat the pattern taught in the examples we have just studied. Taking all the Bible says, we learn that, in order to be forgiven of sins, a person must hear the gospel, believe it, repent of sins, confess Jesus, and be baptized. Some churches teach that sins are forgiven as soon as one believes in Jesus or when one prays for forgiveness, even if he has not been baptized. But the Bible shows that faith must lead one to repent, confess, and be baptized. Only then are his sins forgiven. Have you followed the true Bible teaching about what one must do to be saved? Click here to learn more about salvation from sin.